In my research work with academics with fibromyalgia, I am using creative methods, such as the identity boxes to understand people’s experiences. That means that the data I receive is often untraditional data. I have photos, objects, soundscapes, song lists and poetry. So in order to make sense of my participants’ experiences, I am creating an installation for an art gallery. This “fibromyalgia chair and table” demonstrates what it is like to have fibromyalgia. Through the process of creating the installation I feel that I get closer to the participants’ experiences and get a better understanding of what life with fibromyalgia is like for them. At the same time, the process of curating is analysis. I reflect on the data, code, select, prioritise. The installation is the artistic outcome and representation of a research project into the experiences of those diagnosed with fibromyalgia. Fibromyalgia is a contested condition that is characterised by widespread chronic pain, psychological disorders, cognitive dysfunctions (brain fog) and sleep disturbances. My installation is an armchair with side table and TV. 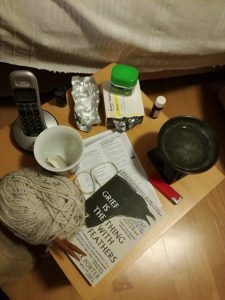 I am using a range of objects (arranged around the armchair and side table) to show how fibromyalgia is managed: hot water bottle and ice-packs, pain killers, vitamins and anti-depressants, amidst more enjoyable items such as books or knitting – although the pain and brain fog make it difficult to focus. The TV will be on a loop showing two simulation videos that demonstrate the cognitive dysfunctions. I will have a laminated guidesheet, which will include explanations around the conditions and the significance of the objects on display. Also, the sheet will include the poem “Peace Treaty”, which lends its name to the installation. 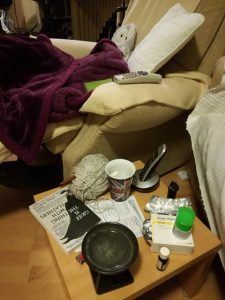 The materiality of the installation and the representation of lived experiences and feelings show domesticity in the context of a chronically ill and disabled person; a person, whose physical condition confines him/her to the living room instead of a workplace. Through artistic means the installation seeks to inform, teach, raise awareness, develop empathy and understanding and thus to have a long-lasting effect on the gallery visitors.